PLEASE keep in mind the difference between Dramatica theory and the process of writing!!! If nothing else, NOTE THAT! The Dramatica theory says that "every complete story" is an analogy to a single human mind trying to deal with an inequity. But even in the very first chapter of the theory book, I point out that not all stories are complete and they are neither better nor worse because of it. Some ways in which authors affect audiences are NOT stories and in fact, NOT about communication. They are about creating a fertile environment in which the audience can author its OWN experience. The human mind seeks patterns in all that it sees (logistically speaking) and seeks meaning (emotionally speaking) in all it experiences. When we turn out logic on our experiences, we see emotional patterns, when we turn our emotions on patterns we give them value. One valid approach to creating a "work" for an audience would be to present a series of words that have no intended meaning, As an example, take your dictionary and arbitrarily open it and point your figure to a series of words. Now, that will have no intent behind the sequence, yet an audience will try and even succeed in finding meaning. As an example, I’ll do that now and list what comes up: Yes, waters, invisible, everyday, techniques, another, home. Okay, I meant nothing by that, it was completely arbitrary, but, does your mind not seek to find some order and meaning in it? Yes, waters, invisible, everyday, techniques, another, home. Heck, it’s almost poetry! In reading it now, I see connections and make in my own mind the belief that "Yes, waters of flowing force, invisible in my everyday life spur me on to master techniques, never enough, yet if I can find just another, I might finally be home." Now, you probably got something completely different out of it than I did. But not so totally different that it didn’t play on the words, which were the "givens." If I had actually CHOSEN the words by looking for them instead of pointing without looking and then seeing what word I unknowingly had chosen, then one could say I instilled some meaning in the words. The point is that even random data is interpreted by an audience which draws on personal experience to give it meaning. Now, at the next level, I put together "random" words, but with a purpose: Red, slicing, quivering, screaming. No one can tell exactly what I had in mind, but the images the series of words invoke carry an impact that will likely be strongly felt. I’m still not telling a story, much less a complete one, but I am definitely beginning to communicate. In fact, I’m probably communicating all kinds of things about ME, the author, of which I’m not personally aware. Next I write: Pig, falling, earth, trembling, run, hide, bacon. Here I meant something particular. It may be not fully clear, but suddenly there is a picture starting to form. Some pig is falling (from a plane, a truck, a hill?). It hits the earth so hard that it trembles (or the anticipation of trembling). I (we) run and hide to avoid the gooey mess that follows (or being squished by the hog). But, we return to gather the remnants and enjoy a crispy plate of bacon. Many of you will have likely gotten some similar interpretation to the one I describe. I’ve communicated to a greater degree. Ultimately, I might write: A boy walks down the street, he trips and falls and skins his knee. This is much more clear, though we know little about the boy’s feelings. This is a logistic TALE, not a story. It is simply a step by step "headline" that describes a series of events which could happen. Next I write: A boy feels that his father is full of it, so he ignores his advice and then comes to recognize his father’s wisdom. This is a clear description of the boy’s feelings, though has little in the way of specific information. It is an emotional tale - a mood by mood emotional journey, the "heartline" that describes a series of emotions which could follow each other. If I put them together, I create: A boy feels that his father is full of it, so he doesn’t tie his shoelaces, which he thinks are cool untied, when his father warns him about them. He crosses the street, trips on the laces and skins his knee. Through his pain he comes to realize that his father perhaps was right. Now, this is as far as a TALE can go. It has a linear headline and heartline that work together. If we were to add, "In fact, the boy now realized his father might be wise about a number of things and deferred to his judgement in the future," THAT does NOT ring true! It is a blanket statement and needs to be proven on a case by case basis. If I were to construct a work in which all appropriate experiences were included that would be necessary to bring the boy to that conclusion, however, then I would have fashioned a story. If I were to then expand the work to "prove" that young boys should ALWAYS defer to their father’s wisdom, I would have fashioned a COMPLETE story. As we can see, all of the above examples which became progressively more complex are contained as subsets of the complete story, with the notable exception of the random words of the very beginning. Dramatica was designed to represent the complete story, with the understanding that authors may often wish NOT to tell a complete story but only some subset of one. Dramatica does not look at anything OTHER than a complete story as being LESSER than a complete story - just different. Different approaches for different intents. Further, Dramatica deals with the underlying logistic structure of the story’s argument, linear progression, or inter-related meanings. As such, it contains nothing of the passion and inventiveness an author will call up in the telling of the story. Story Structure is a Craft. Story Telling is a Talent. Talent can’t be taught, but Craft can. The first thing to consider is, if it works, don’t fix it! In other words, if you are having no structural problems with your tale or story, then STAY AWAY from Dramatica - you’ll just start overthing the plumbing. And, even if you want to do something a certain way and Dramatica says it isn’t accurate, that doesn’t mean it isn’t right - just that it isn’t accurate. Writing, to be fulfilling, must come from the heart. It might be satisfying when it comes from the head, but not fulfilling. If you’re head and heart come to different conclusions, what do you do? Well, some writers prefer to stick to the accurate structure, and others decide to go with the path that is more interesting to them. Either way is fine, as long as it is YOUR way. If Dramatica says one thing and you want to do another, well then DO IT YOUR WAY! Even if you weaken or even break your structure, does that really matter if the path you chose is so passionate that your audience is enthralled? Audiences don’t require perfection. They DO, however, require that you don’t try to sell them swampland. In other words, some aspects of structure can be easily discarded for the sake of a powerful statement, scenario, argument, or character moment. But others are so crucial to the underpinnings of a story’s structure that the story will collapse if they are changed. Which are the most important? Dramatica can’t tell you that. It can just tell you what the structural elements are and how they should fit together to create a "perfect" structure. The rest depends largely on your abilities as a story teller. So, DON’T USE DRAMATICA if it even slightly starts to inhibit your storytelling passion. Use it when you get stuck, use it to get an overview of your story’s structure - to learn about story points that ought to be there that you might not have considered. Then, go off and write. Write from the heart, write what you care about. If it comes out just the way you want and everyone connects when they read it, don’t go back to Dramatica. But if a draft has problems you can’t identify, then analyze that draft with Dramatica, see what structure you ended up with, as opposed to what you intended to create. Take notes of where the significant problems are caused by inaccurate structure and then whip them into place. In the end, learning the Dramatica theory helps fine tune your instincts so that the structures of your stories will become more and more sound, even when you aren’t thinking analytically, but are just creating from the heart. If and when those instincts aren’t quite on the mark, that’s when you haul out the software. 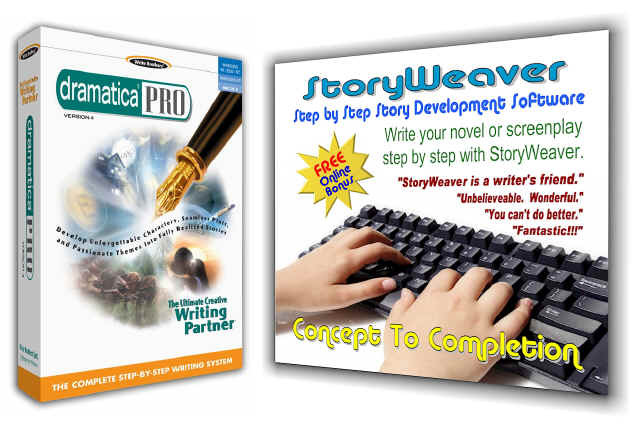 The Dramatica software is nothing but a tool - in fact, a collection of tools. Use the right tool for the right job. Hammer your structure into place and then let your instincts turn the remodeled section into art. Artists use pre-mixed colors and then create their own shades. Bricklayers run strings to ensure walls stay straight. Composers choose notes and fashion chords. All of these activities can be analyzed in structural terms, but are actually performed by feel and experience. Let your heart be your guide and Dramatica be your hammer.